When student-led community service projects connect to what students are learning in the classroom, the benefits are endless. With environmental service projects, students are able to connect classroom curriculum to the real-world consequences of their actions on their communities. Courtesy of USGBC. Students at Cordova Middle School in Tennessee learn from their district’s sustainability staff about air quality monitors they will be using to take measurements around their school. Green Apple Day of Service, an international effort to improve learning environments and prepare the next generation of global leaders in sustainability, acts as a critical link between classroom instruction and practical application. Each year, Green Apple Day of Service participants set their project date for any time throughout the school year and work with their communities to provide sustainable and healthy learning environments and increase sustainability literacy in students and their families. Though putting together meaningful and effective service projects with a school community may seem daunting, Green Apple Day of Service projects can be as simple or as in-depth as the school needs or wants. The best approach to creating a project is identifying a critical sustainability issue for the school and framing the project to address that issue. The Green Apple Day of Service website offers project ideas with curriculum connections as well as planning resources to help schools create and implement a project. Small mini-grants are available to help with project materials and supplies. Courtesy of USGBC.Students at Common Ground High School in Connecticut discuss green careers with a professional from their community. Here are some exemplary projects from past years to help get you inspired for your own project. 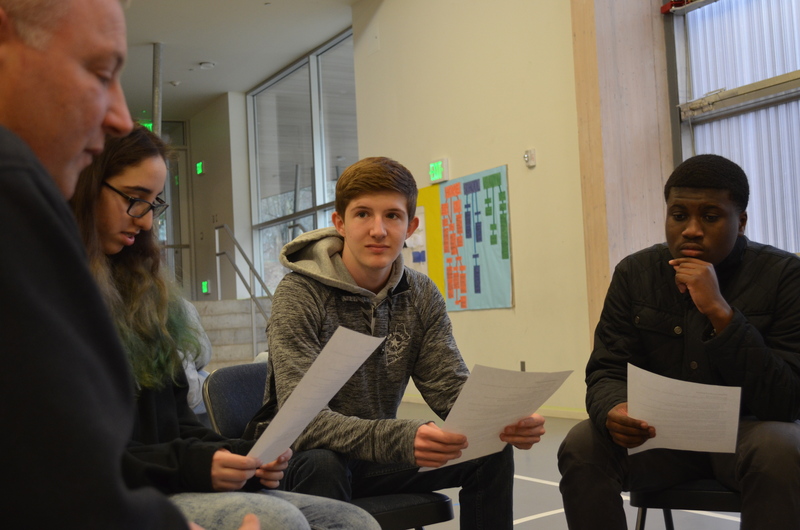 At Common Ground High School last year, students met with sustainability professionals to get inspired and grow their understanding of green career paths. A dozen sustainability professionals in different fields were on hand to talk with students about their education backgrounds and career paths, and students could choose which professionals to sit with for ten minutes each in what the organizers called a “speed greening” event. Students were inspired by the professionals’ dedication to making the world a better place, and both groups left the day feeling encouraged and focused on a sustainable future. This project was supported by Common Ground’s local Green Building Council. If you’re feeling inspired to create your own speed greening project and can’t find local professionals through your USGBC community, then check out Nepris to connect your students with sustainability professionals remotely. Cordova Middle School students recognized the health risks linked to vehicle exhaust and the significant population of people living with asthma in their area. To address these issues, the students led an anti-idling campaign around the school to reduce the exposure to vehicle exhaust that is inevitably created from the student pick-up and drop-off car lanes. The students educated their community on the dangers of vehicle exhaust and the benefits of simply turning cars off while stopped. Using donated Personal Air Monitoring devices, students tracked air emissions around the school in order to measure the effectiveness of the campaign. The results showed significant decreases in carbon dioxide and carbon monoxide, and the students are continuing their campaign to further improve air quality around their school. If you’re inspired by this project, checkout the Raise Awareness of Outdoor Air Risks project idea for guidance and resources to plan a similar project. Feeling inspired to join the movement? Register your project before March 15, 2019 to be eligible for $200 mini-grants.